3. Maybe this exists, but I find it easier to move the pivot point of a layer in AE, or even snap it to the center of an object. And that is really useful for controlling rotation and scaling. I know you can move the pivot point in fusion, but I'm always flailing around to select it, and then have to do it numerically, so it slows me down. So that one is probably on me. 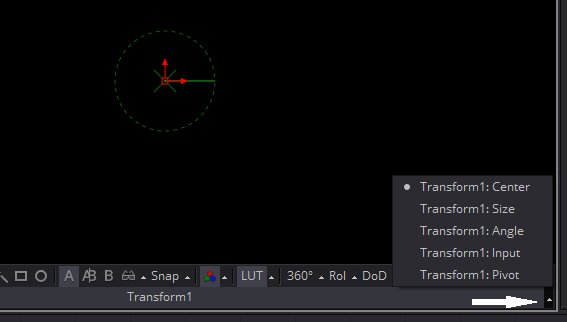 Not sure if you know about this or not, but with tools like the transform, you can click in the viewer with the mouse then press Tab multiple times. This switches the tool controls that are highlighted (in red). If you do that multiple times, the 'x' view control, which controls the pivot point, will get highlighted, and you can then easily move it in the viewer similar to what you can do in AE. That just changed my life. There's also a tiny little button in the lower-right of the Viewer window that lets you choose the active control. It works for switching between the inner or outer shape when you have a double polygon, too. Glad I could be of help. Also, take note of the tip Bryan mentioned in the previous post. I didn't even know about this one.